This is my buddy Sara, she is pretty rad. She takes me on cool running adventures and helps me out of forests when I fall and hurt my ankle. 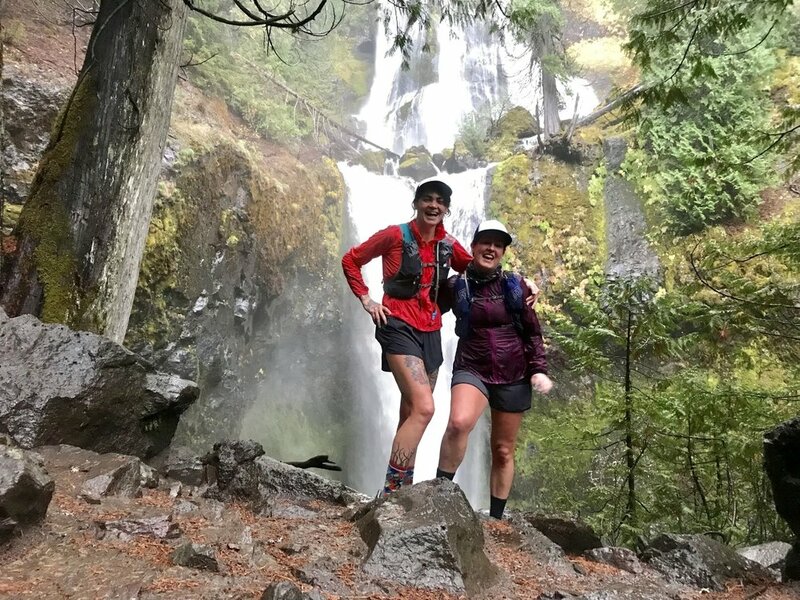 Another great weekend of adventure running and this time to the amazing Falls Creek Cave, on the Falls Creek Falls trail in Skamania County, Washington. Just a 90-minute drive from downtown Portland, through Carson city, WA and into the beautifully mystic Grifford Pinchot National Forest, lies the soft, loamy and easy trail of Falls Creek Falls. An easy 18 mile out and back trail takes you past the beautiful Falls Creek Falls, and loops you out to the Falls Creek Cave, which is very remote and hardly visited making this trail a very cool trip if you like to be out adventuring and caving without all the crowds. These old lava tubes, or huge cavernous caves stretch about 2 miles underground from the end of the trail, and are a beautiful thing to behold. Spooky, dark and cold, climbing down is definitely and adventure. So climb down we did and walk the tubes we tried, scrambling over boulders and trying to find footholds in the dark. Beware hibernating snakes, and ensure you bring a headlamp, it is pitch dark and cold down there. The trail was obviously 18 miles in total, but soft and loamy with Pacific Northwest beauty and tree cover. It followed the river most of the way so if you run short of water there is always a supply. Bring, gloves, headlamp and a jacket - the caves are dark and cold! Trail Tracking Aerial awesomeness below! Thanks for the read, for more adventures Please follow on insta!